While you’re staying with us at the Durango Quality Inn, be sure to check out the plein air art exhibit that opens Friday and runs through Aug. 17 at the Durango Arts Center in downtown. 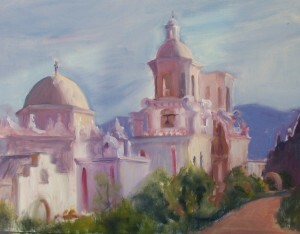 San Xavier Mission, oil painting by Judy DeVincentis Morgan. “In the Open Air: Plein Air Painters of the Four Corner” is a juried exhibit that features several dozen artists who are members of the regional group, Plein Air Painters of the Four Corners. The exhibit will kick off with an opening reception 5-7 p.m. Friday in the Barbara Conrad Gallery at the Durango Arts Center, 802 E. Second Ave. Although the exhibit opens Friday, the Plein Air Painters will hold a plein air “paint-out” in downtown Durango from 10 a.m. to 3 p.m. Tuesday. And if you’d like to get your brush dirty, sign up for one of two plein air painting workshops that are being held in conjunction with the exhibit. Artist Joshua Been will lead a three-day workshop July 26-28 called “The Plein Air Landscape: Practical Advice to Better Your Landscape Painting; How Plein Air Informs Studio Work,” and artist Judy DeVincentis Morgan will offer a daily class Aug. 1-3 to teach students how to paint in the Great Outdoors. Contact the Durango Arts Center at 970-259-2606 or email Lori Walters at loriwalters@bresnan.net for more information or to sign up for the workshops. And be sure to reserve your room at the Durango Quality Inn to rest after a long day of painting in the elements!